The great advantage of having a chauffeured car in India is freedom – freedom to drive anywhere, stop for as long as you wish and more importantly, flexibility to come up with a new destination a few days or hours prior, pointed it to your driver and have him get you there. 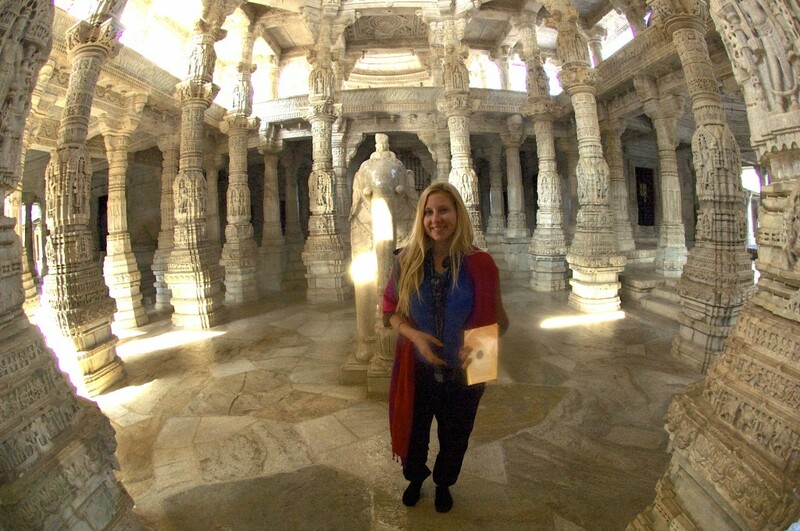 After spending two full days in Udaipur, Sunil and I left for Jodhpur, however, on the way, I had instructed him to stop by two places that were recommended by every travel guide: romantic fort Kumbhalgarh and the largest Jain temple in India – Ranakpur. 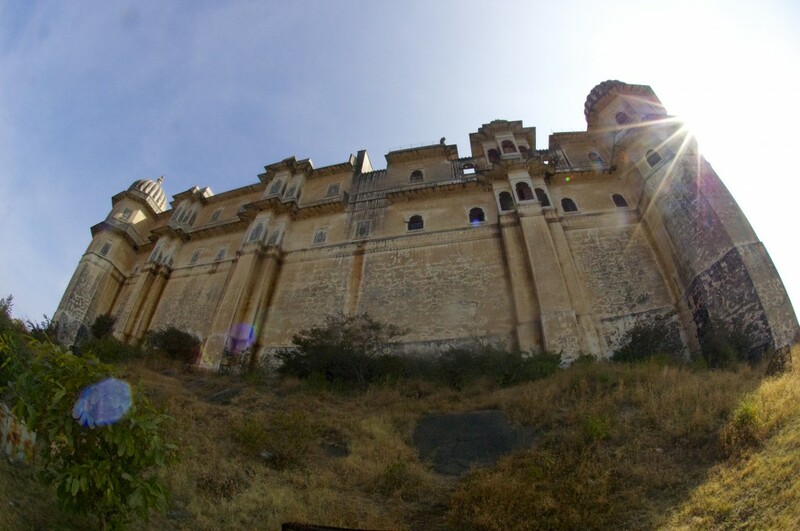 We left at 7 am and 2 hours later reached Kumbhalgarh, which is located 82 kms north-west from Udaipur. The zig-zagging road to the top of the 1,100 m Aravalli Hill is hands down one of the most picturesque drives in Rajasthan. 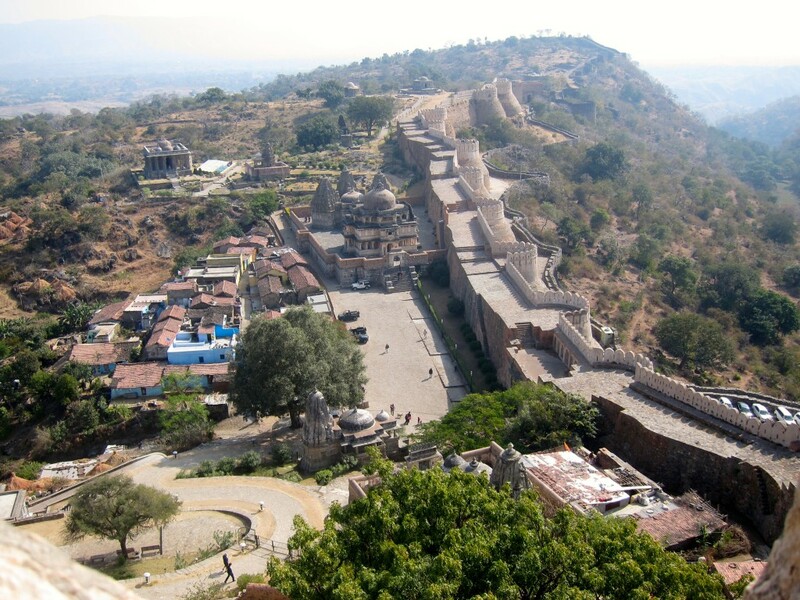 Kumbhalgarh played an important role in the history of Mewar dynasty, particularly from the time of Maharana Kumbha to Maharana Pratap (1433-1597). 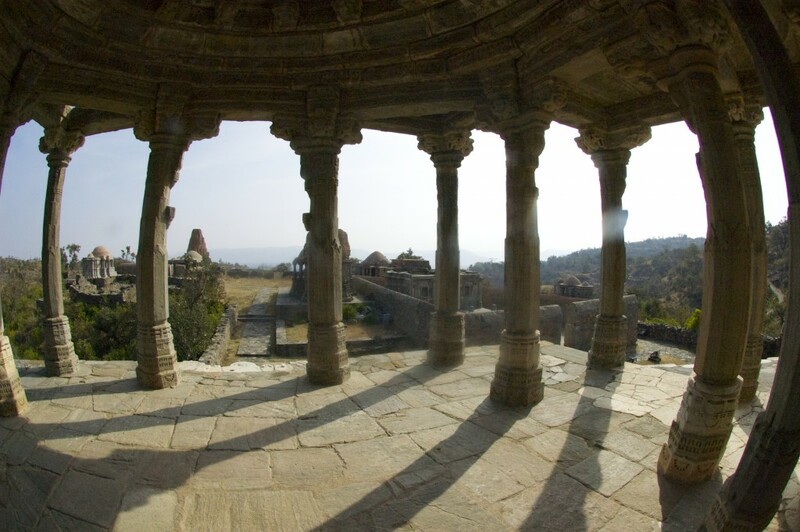 Second only to the Chittorgarh fort, the rulers wisely used to retreat there in times of danger. 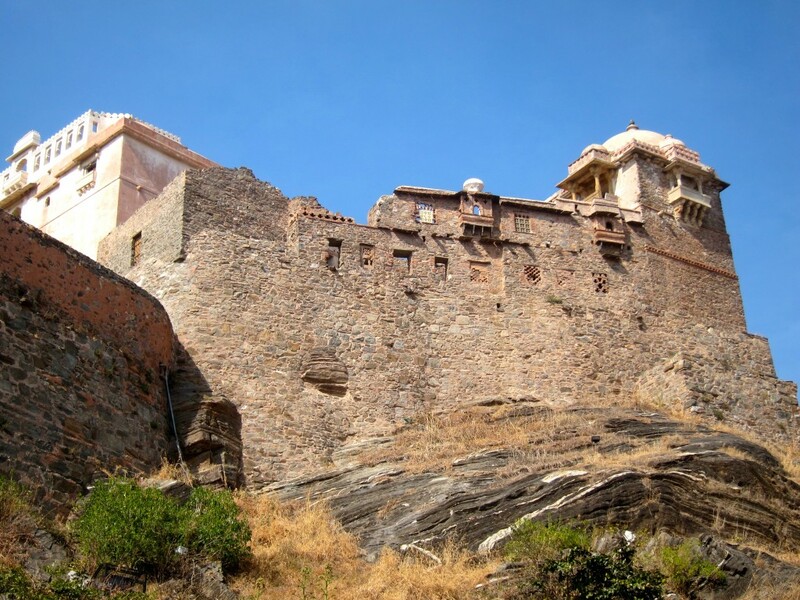 Not surprisingly, Kumbhalgarh was taken once and only for two days by the combined forces of Mughal Emperor Akbar, Raja Man Singh of Amber, Raja Udai Singh of Marwar and the Sultan of Gujarat. It is said that 3 women of Mali caste showed the secret entrance to the enemies and as punishment, they were bricked alive in the wall of the fort and stone heads of three women were put on demonstration on the exterior of fort wall on the right of Ram Pol. 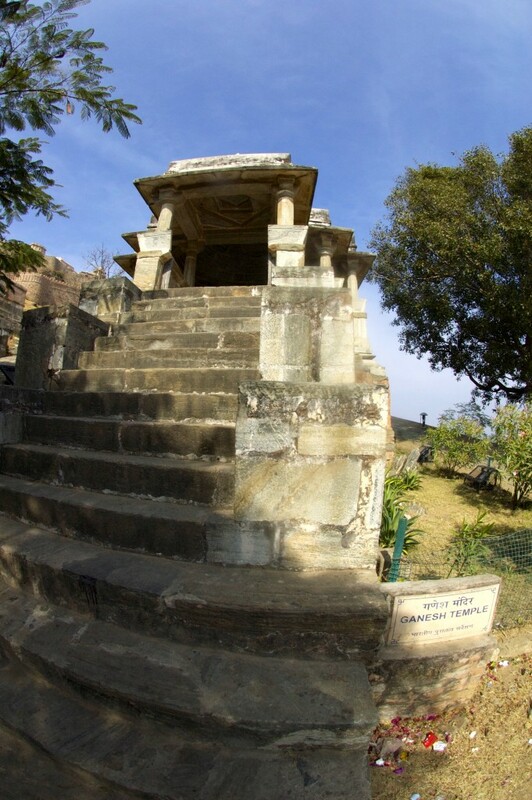 The earlier history of the fort is somewhat obscure in the absence of adequate archeological and literary evidences; however, legendary tradition says that in ancient times Kumbhalgarh was known as Machchindrapur and was associated with King Samprati of Maurya dynasty who built the original fort. There is no archeological or historical evidence that links Samprati to the construction of the fort, although the remains of an old wall, few structures and a small fortress (around the 2nd century B.C. ), near Juna Bhilwara village and Pitaliya Shah Jain Temple appear to belong to pre-Kumbha times. The traditional version of the history of Kumbhalgarh says that the fort was built by Mewar’s Maharana Kumbha of Sisodia dynasty. Out of 84 forts in his dominion, Rana Kumbha is said to have designed 32 of them, of which Kumbhalgarh is the largest and most elaborate. According to legend, in 1443, Rana Kumbha attempted to build a fort on the top of the Aravalli hill, however, despite all his efforts, every morning he woke up to see the constructions of the previous day to crumble. As a religious person, he consulted a spiritual preceptor who advised the ruler to find a volunteer to serve as a human sacrifice. The king sent out word, but no one volunteered, until one day a pilgrim (another version – a solder) came about with his desire to be decapitated, so the Rana could build his fort. According to the prediction, the sacrifice was necessary to ensure that the battle walls of the fort would be strong enough to withhold the sieges. Today, the winding 15 feet wide walls of Kumbhalgarh, second only to the Great Wall of China, stretch for more than 36 kms, allowing 8 horses to ride abreast. There are 7 fortified gateways to the fort, including Ram Pol through which I entered and Hanuman Pol containing a shrine and a temple commemorating a person who sacrificed his life for the fort to be built. After purchasing a ticket (Rs.100) and a guide book about Kumbhalgarh (Rs.50), I went inside. It was still very early and cold, and no guides were available for hire, so relying on my sight and a moment-ago purchased book, I went on what it turned out to be a 6 hours tour around the fort but more importantly around 360 intact and ruined temples, some of them dating back to the 2nd century B.C. Right of the Ram Pol, there is Vedi-Temple complex, built on raised platform enclosed on three sides by high walls. It comprises of Yajna Vedi, square chhatri and triple shrines. 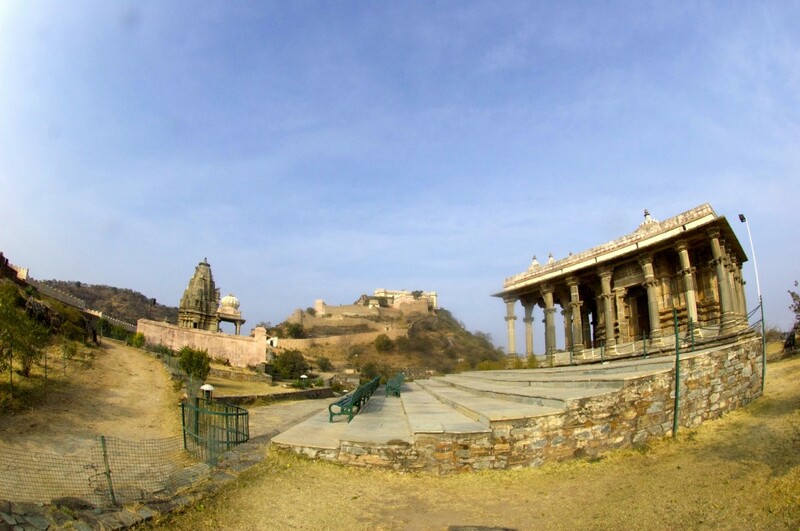 This complex is one of the most imposing structures in Kumbhalgarh for performing yajnas on completion of the construction of the fort by Rana Kumbha in 1457 A.D. An image of six-armed Vishnu seated in lalitasana on Garuda is enshrined in the sanctum of the shrine on the right. A square-pillared chhatri, probably meant for offering sacrifice during the time of yajna, is in the center between the triple shrines and the Yajna Vedi. I continued walking away from the fort towards the rising spires of ancient temples. I can’t name all of them, but I will try to mention and describe a few I remember. Neelkanth Mahdev Temple dedicated to Lord Shiva, built in 1458, faces west. It is rectangular in plan with seven domed roof, supported by 26 gigantic stone pillars with lotus finials at the top of central dome. 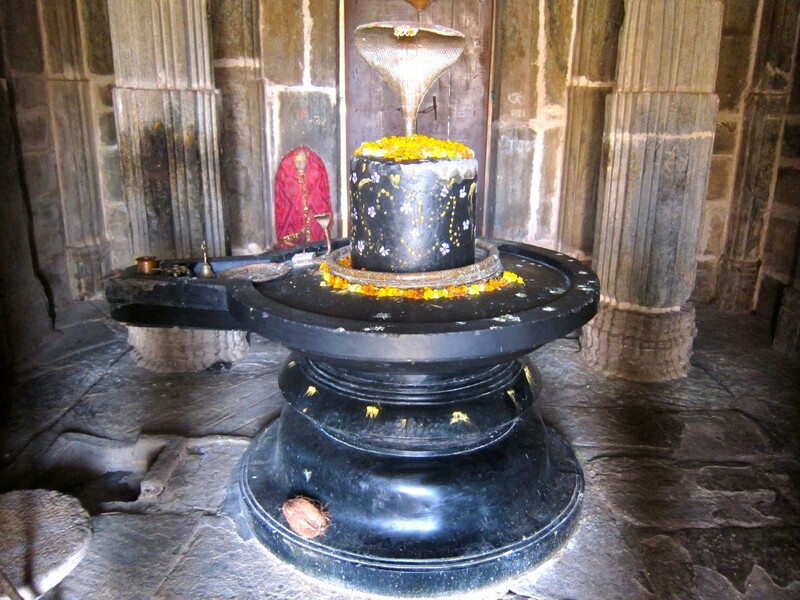 The huge 6 foot high Shiva-linga of black stone with yoni pitha is the only deity in the area still being worshipped and maintained by the locals. A legend says that Rana Kumbha was so tall that when he sat for his prayers on the floor of this temple, his eyes were on level with the deity. He never began a day without performing prayers himself and what an irony that he was beheaded by his own son, as he prayed. I passed by Parsvanatha Temple, Mataji or Kheda Devi Temple, Jain temples near Vijay Pol, towards Bawan Deori, an imposing group of 52 temples built in 1464, of which fifty are equal in size and arranged all around the outer wall with their entrance towards courtyard. 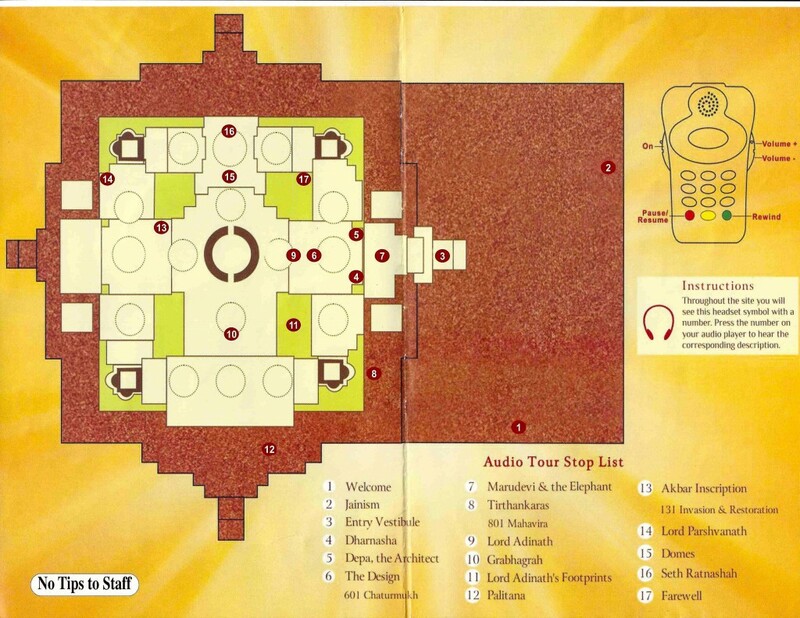 Two main shrines – one in the center of back wall and the other in the middle of the court, are larger in size. The main shrine has pancharatha sanctum with curvilinear sikhara, an antarala and an open mandapa with square interior and dome ceiling. The facade of the sanctum is lavishly carved with floral designs and human figurines. Mukhamandapa (frontal pavilion) is decorated with apsaras in different postures playing with balls, vina, holding mirror, necklaces, chauri bearer etc. Further up the hill, I entered Golera group of temples, containing nine shrines, of which 4 are dedicated to Jain pantheon, while the remaining 5 are brahman shrines. Built on elevated rocky surface, Temples stand majestically and attractively on the highest point on the western part of the hillock, approached by the flight of steps from east. There is a chamber below the western mandapa with a narrow entrance from the west, where 24 headless stone sculptures were found, now kept in the museum. Every temple I encountered was a little discovery in itself, standing on circular terraces or patterned platforms, they all were beautifully carved and despite their visible hollowness, had a story to tell. By then, I spent 4 hours browsing the empty temples while walking away from Kumbhalgarh, so I turned around and after shedding a few layers of clothes, since it finally got warmer, proceeded towards the fort. To the left of Ram Pol is Ganesha and Charbhuja Temples. Ganesha temple was built by Rana Kumbha and the image of Ganesha is enshrined in the sanctum. Standing on the high platform, it can be entered via the flight of steps from south, it has a garbhagriha, an antarala, a mandapa with pillared kakshasana followed by mukhamandapa. Charbhuja Temple is dedicated to four-armed goddess, it is raised over a high platform and enclosed by a prakaram walls. The Palace-Complex comprising of three magnificent structures – Badal Mahal (Fateh Prakash), Kumbha Mahal and the birth place of Maharana Pratap located on the top of the ridge. After climbing a pretty steep ramp, I entered the palace grounds near the ancient baoli which was used to collect rain water. 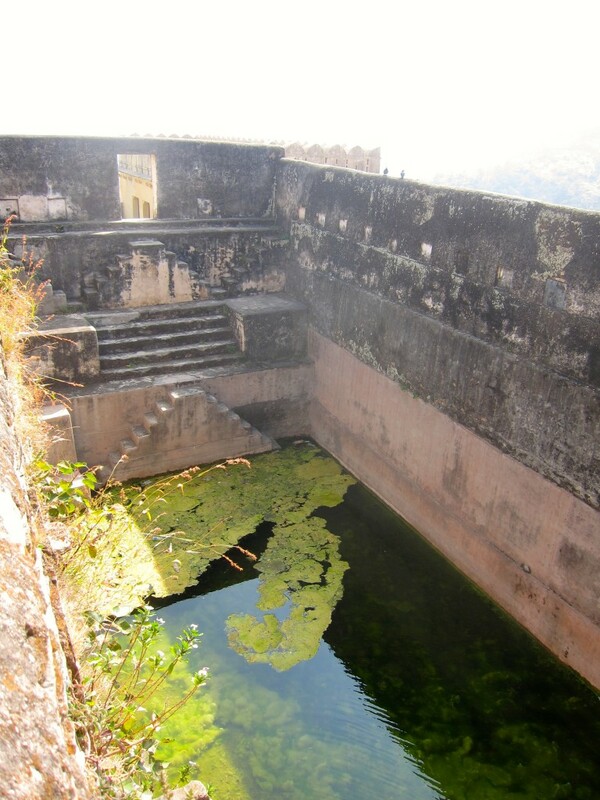 The largest rectangular tank is located near the birth place of Maharana Pratap, however, there are over ten dams and more than twenty stepwells within or outside the fort. The dams were built at a narrow valley by providing huge stone masonry walls at regular intervals. Walls are longer on the top and gradually become shorter while extending down towards slope. Similarly, walls are the thickest at the base, but slowly thinning at the top while maintaining the height of the dams. Provisions have also been made to release excess water by outlet at the corner of the top. Stepped landings have been built from top to bottom with arch-shaped structures in the center to lift water through Persian wheel system. Series of niches were also built on the inner face of the walls for fixing some images, but now they stand empty. 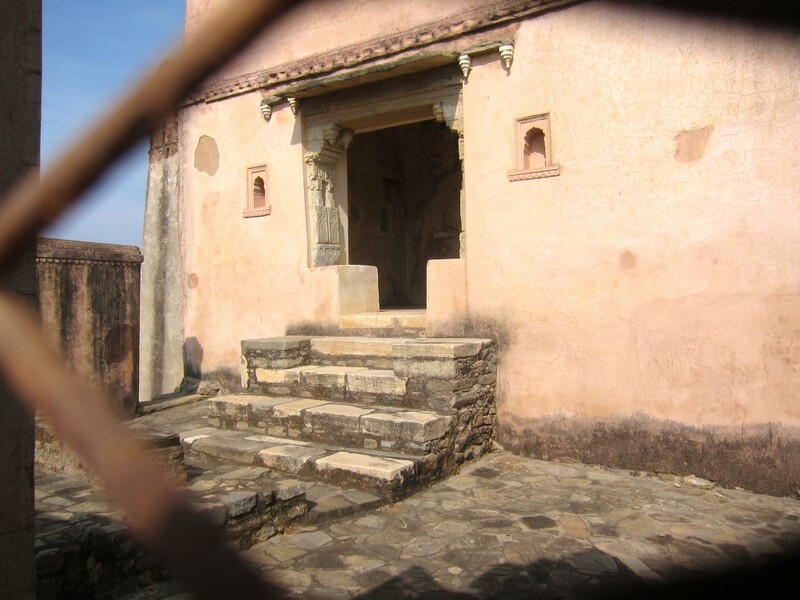 Next to the water tank was a place where Maharana Pratap was born, however, the staircase, leading towards the room or group of rooms was closed, so I wasn’t able to get inside to check it out. There was no route around the palace complex, but I continued going straight to see the palace from the other side and take wonderful pictures of it and views from the Aravalli hills. By then, I could hear dozen of voices from the palace’s roof, however, it felt as if there was no one around. After returning to the palace gate, I first proceeded to the lower terrace of Kumbha Mahal. This double storied edifice standing the vagaries of time speaks of the Rana’s greatness and love for architecture. Not comparable by size to the one in Chittorgarh, Kumbha Mahal most definitely was the most luxurious of two. The ground floor consists of a rectangular hall with small chambers and open courtyard. Between Kumbha Mahal and Badal Mahal is another two storied building with an open courtyard, the ground floor of which was used as a shrine dedicated to Nava Durga. In front is royal kitchen built probably by Rana Prakash. The network of passages, hidden rooms, lower and upper levels connected by hard-to-find staircases, make Kumbha Mahal a wonderful labyrinth of history. I was curious enough to climbed up and down, explore all, even crumbling rooms and by chance, return to the 15 century. The newest palace, Badal Mahal was built by Rana Fateh Singh (1884-1930). 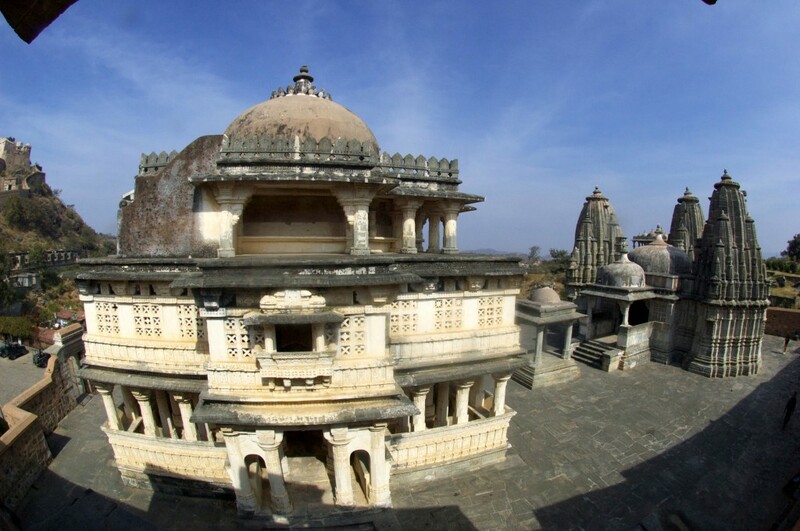 Standing on the highest point of Kumbhalgarh and facing east, this two storied palace is constructed in two parts, Zenana mahal and Mardana mahal, with several sets of large and small rooms. The walls and the ceiling of the rooms of upper floor are painted with floral designs in various colors, whereas the lower half of the walls of the ground floor depicts the fighting scenes. Zenana Mahal has stone jalis which facilitated the queens to see the court proceedings and other events in privacy. 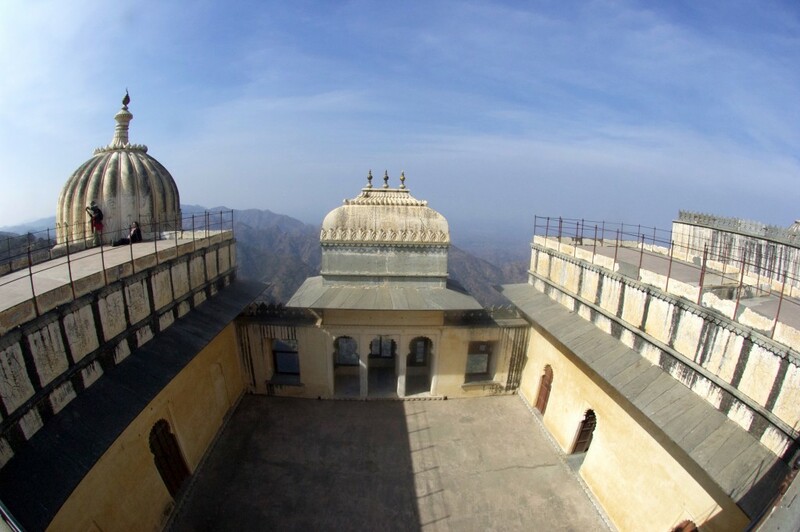 Many rooms are under restoration, but the views from the roof of the palace to the jungle covered hillsides and across the deserts of Mewar towards Jodhpur, are simply stunning. 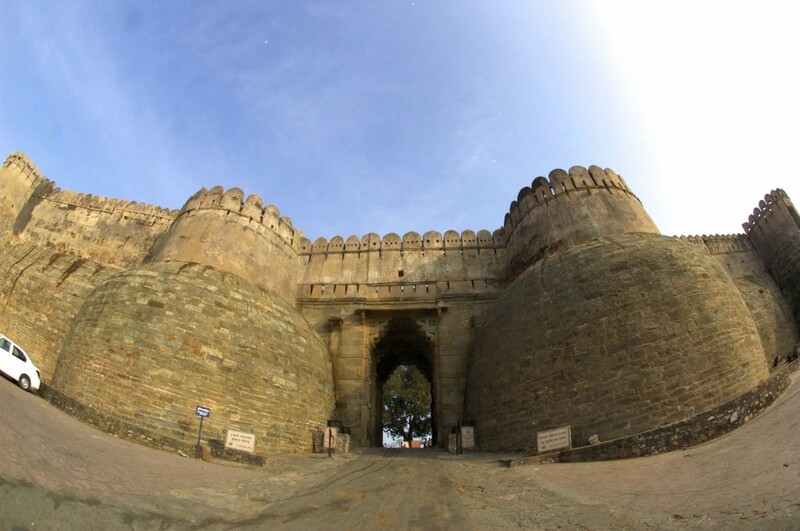 It is easy to get lost in time as you stand on the walls of the fort or browse through its multiple palaces or temples, listening to the stories of the legendary king Rana Kumbha – the king who gave his name to the area, and who lives on through his deeds long after his tragic demise. After 6 or 7 hours spent in Kumbhalgarh, to the immense joy of bored Sunil, I finally re-emerged from the fort. We planned to visit another site, on the way to Jodhpur – Ranakpur, India’s most important and largest Jain temple. 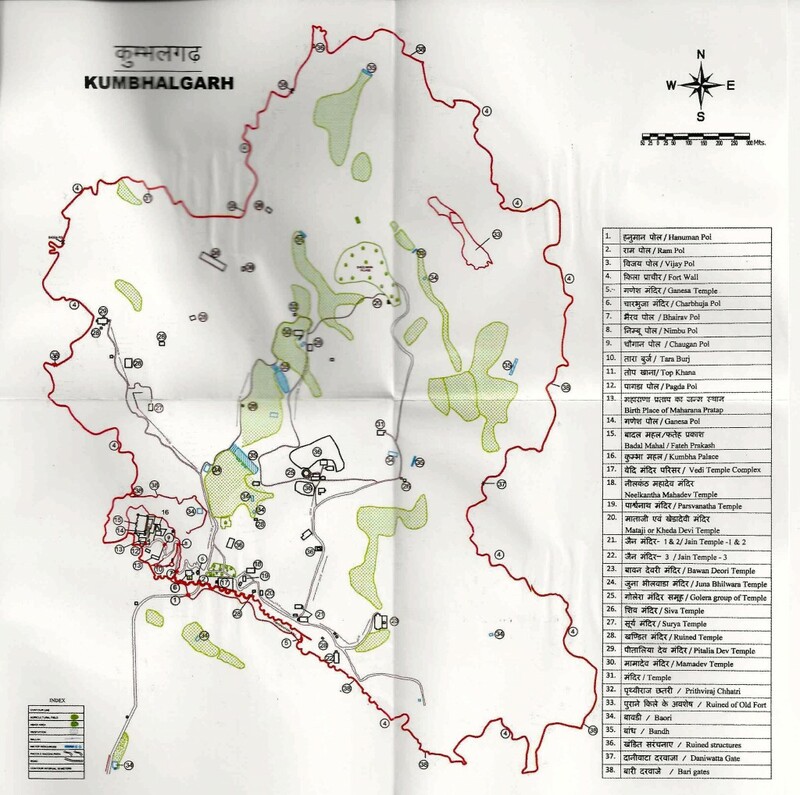 23 kms west of Kumbhalgarh (by air), it is a 50 kms drive via Saira. 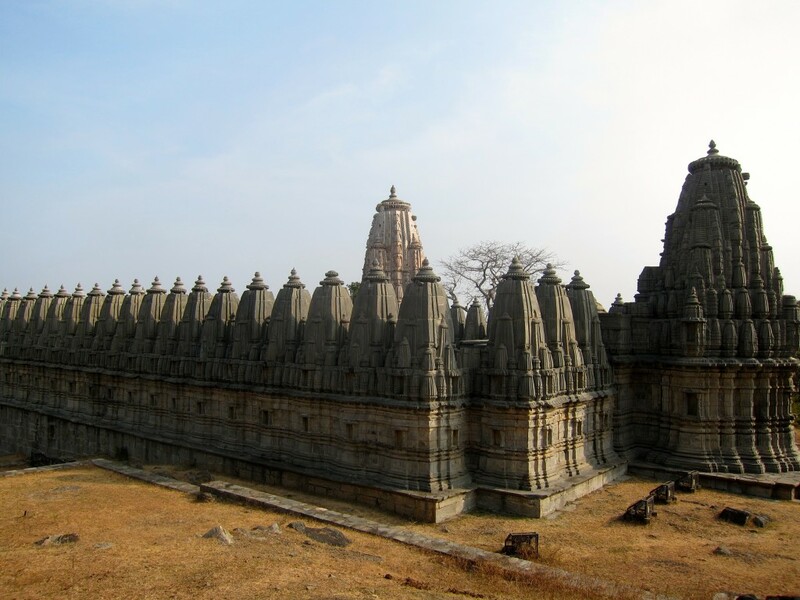 The construction of Ranakpur is well documented on a 1437 copper-plate located in the temple and in Sanskrit text Soma-Saubhagya Kavya. Inspired by a dream of a celestial vehicle, Dhanna Shah, a Porwal, commenced its constructions under the patronage of Rana Kumbha. The architect overseeing the project was Deepaka and there is an inscription on a pillar near the main shrine, stating that in 1439 Deepaka constructed the temple at the directions of Dharanka, a devote Jain. When the ground floor was completed, Acharya Soma Sundar Suri of Tapa Gaccha supervised the ceremonies, which are described in Soma-Saubhagya Kavya. Built in white marble and occupying an area 60 by 62 meters, the temple with its distinctive domes, shikhara, turrets and cupolas rises mafnificently from the slope of the hill like a wedding cake. After paying Rs.200 entry fee (comes with a free audio guide which is a MUST to understand the history and hundreds of little but important details about Ranakpur), two Rs.100 tickets for each of my cameras (I left the phone in the car otherwise, they would have charged me another Rs.100 for the phone camera) and the most thorough body/bag search, I was finally allowed to come in. Note: shoes, cigarettes, leather articles including leather bags and belts are not allowed and should be removed before entering the temple, menstruating women are asked not to enter either; appropriate attire required. The main temple, the Chaumukha Mandir (Four-Faced Temple) is dedicated to Adinath, the first of Jain tirthankara (depicted in many Buddha-like images throughout the temple). The construction of the temple and quadrupled image symbolize the tirthankara’s conquest of the four cardinal directions and hence the cosmos. An incredible construction consists of complicated series of 30 halls, 80 domes and 1444 individually carved pillars none of which is the same. I wish I could prove them wrong, but after an hour of meticulous examination of every pillar, each of which was indeed like none other, I couldn’t see beyond the large picture of the hall. Foreigners weren’t allow to enter the main platform in the middle of the temple, but I definitely had enough time to browse around, admiring the interior covered in knotted, wrought carvings, multiple Jain statues and a beautiful carving made out of a single marble rock depicting 108 heads of snakes and numerous tales. 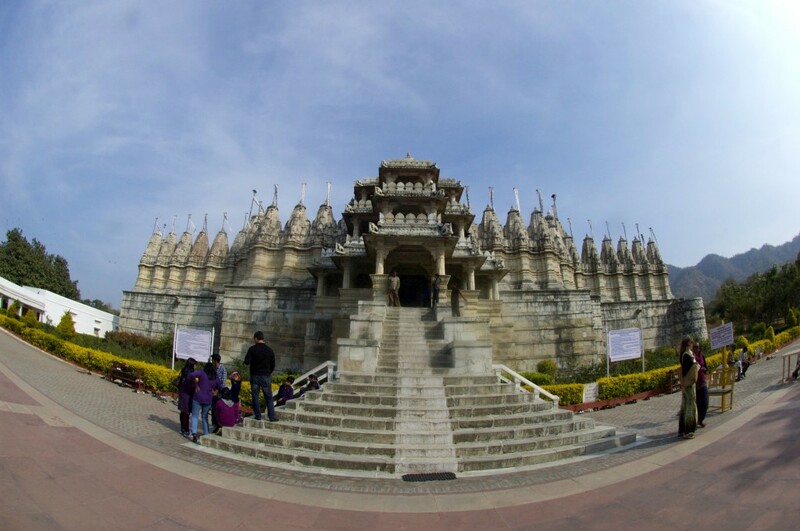 I surely benefited from listening to the audio guide, it provided me not only with the history of Ranakpur, but also Jainism, specific details about the design of the temple, its architect, results of invasions and the story of re-discovering Ranakpur and re-claiming it back from the jungles. A place with so many delicate and intricate details, should be explored extensively and for a long period of time. 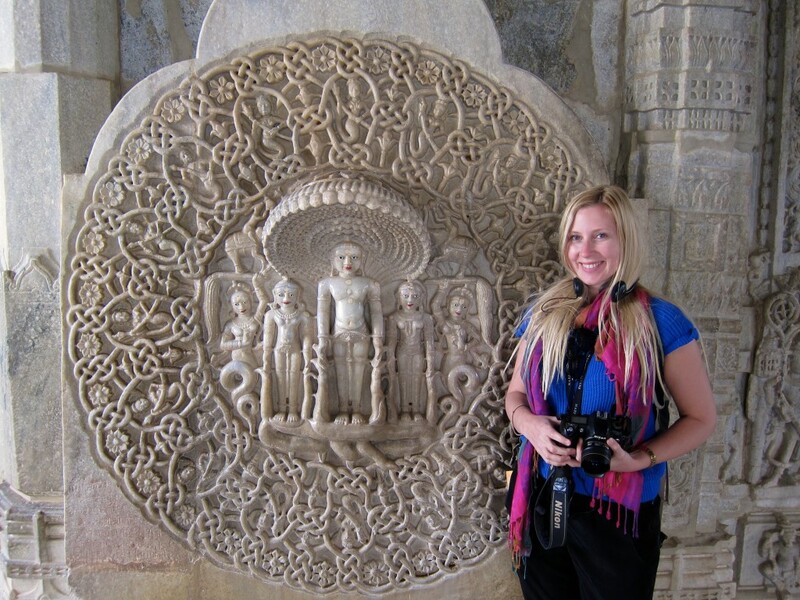 I spent about 2 hours in Ranakpur and could have spent even more if we didn’t have to continue to Jodhpur. This entry was posted in Asia and tagged Acharya Soma Sundar Suri, Adinath, Akbar, antarala, apsara, Aravalli range, architect, Badal Mahal, baoli, Bawan Deori, Brahma, car, Charbhuja Temples, Chaumukha Mandir, chauri bearer, Chhatri, Deepaka, Dhanna Shah, Dharanka, Ganesha temple, garbhagriha, garuda, Golera group, human sacrifice, India, Jain, Jodhpur, kakshasana, Kheda Devi Temple, Kumbha Mahal, Kumbhalgarh, lalitasana, Machchindrapur, Maharana Kumbha, Maharana Pratap, Mali caste, Man Singh of Amber, mandapa, Mardana Mahal, Mataji, Maurya, Mewar, Mughal, mukhamandapa, Nava Durga, Neelkanth Mahdev Temple, pancharatha, Parsvanatha Temple, porwad, porwal, prakaram, Rajasthan, Ram Pol, Rana Fateh Singh, Rana Kumbha, Rana Prakash, Ranakpur, Samprati, Shiva, sikhara, Sisodia, Soma-Saubhagya Kavya, stepwell, Sultan Gujarat, Tapa Gaccha, Tirthankara, Udai Singh of Marwar, Udaipur, Vedi Temple, Vishnu, yajna, yoni pitha, Zenana Mahal. Bookmark the permalink.